This record is for having a meeple at the highest (land-based) altitude. Red wins! 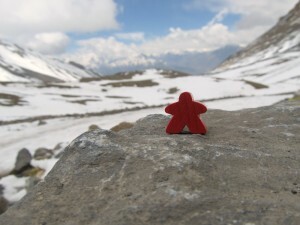 The meeple at 5,416 meters. Macro lens took a great photo. Me with the meeple. 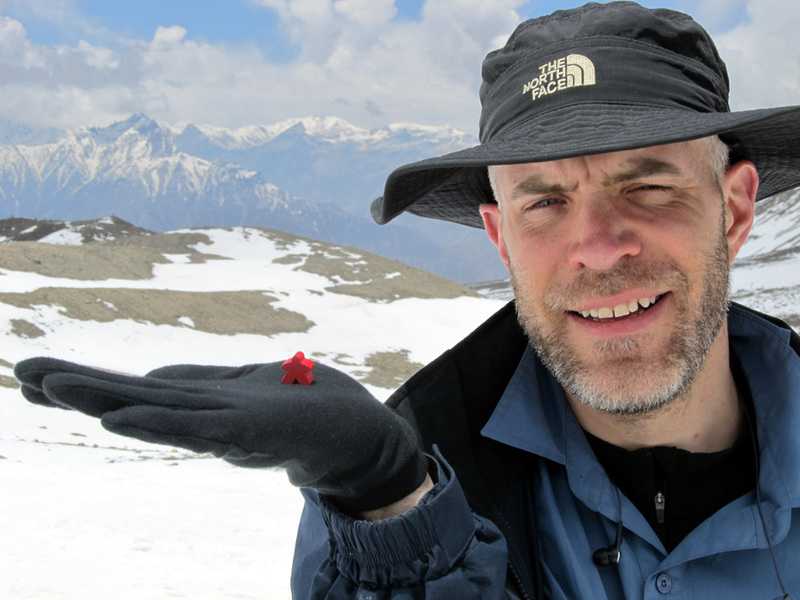 I don’t usually have a beard – it was just during the trek. 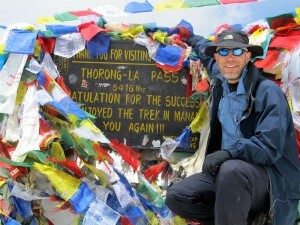 Me with the sign at the top of Thorung La. I actually took several meeple with me. Taken a meeple higher? Get in touch and send in the photo. This record is for playing boardgames at the highest (land-based) altitude. 4th highest at 3,200 meters. 2nd highest: 4,020 metres (13,189 feet) – Yak Kharka, Nepal. 3rd highest: 3,540 metres (11,614 feet) – Manang, Nepal. 4th highest: 3,200 metres (10,499 feet) – Dhukure Pokhari, Nepal. 5th highest: 2,630 metres (8,629 feet) – Timang, Nepal. As I want this record to promote the great games that exist in the boardgaming hobby (i.e. the types of board and card games that I review on this blog); therefore, only games deemed (by me) to be non-mass games (i.e. not Monopoly, etc.) will be accepted. Also, games using a standard deck of playing cards will not be counted either. Yes, it may sound a bit arbitrary to non-gamers but that’s the deal and gamers will know what sort of games count. Played a game that would register in the top 5? Get in touch and send your photo. HOW DID THESE WORLD RECORDS START? Whilst on an 11-day trek in the Himalayas in Nepal – a very out of character trip for me and an incredible experience – I decided to start these 2 new boardgaming world records. The trek took us through Thorung La – the world’s longest/biggest pass – at an altitude of 5,416 metres (17,769 feet)! That’s higher than the 3rd highest peak in the USA and higher than the 2nd highest peak in Europe (and that’s only if you include Russia – as the highest peak in Europe excluding Russia is Mont Blanc at 4,807 meters). I already packed some games for the trip as well as some meeple to get some unusual photos and the idea of starting these records came to me during the trip. WILL THERE BE MORE WORLD RECORDS? I definitely want to add new world records that people can compete for to the list. I don’t have any specific plans at the moment but I’m open to suggestions so let me know if you have suggestions. How about starting a record for most games played “On Location”? i.e. playing a game in the place that exactly matches the title of the game. I have a photo playing Alhambra in the Alhambra somewhere – so that’s one! Photo evidence of course required. I’m feeling a trip to the Caribbean coming on – cover off Havana, Cuba, Puerto Rico, Tobago, San Juan, Jamaica etc. in one go! Yeah, I definitely like the idea of games played on location and the award for most played that way is a great suggestion. Have you got the photo of us playing Alhambra? If so, can you email it to me as I can’t find my copy of it? I’ll add that one as a new record with us holding the record at, er, 1 game. We could go play London (not quite as exotic) to add to our total. 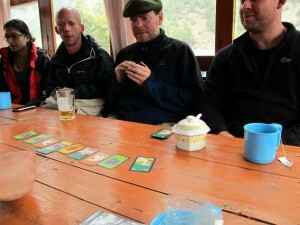 I want to go to Colditz and play Escape From Colditz (on the way out, of course). next month there will be a WR attempt in Deurne, Belgium. They are planning to play the same boardgame for 60 hours! It’s a real event with a lottery, a kubb-competition, game demonstrations, … and all the profit goes to the cliniclowns. 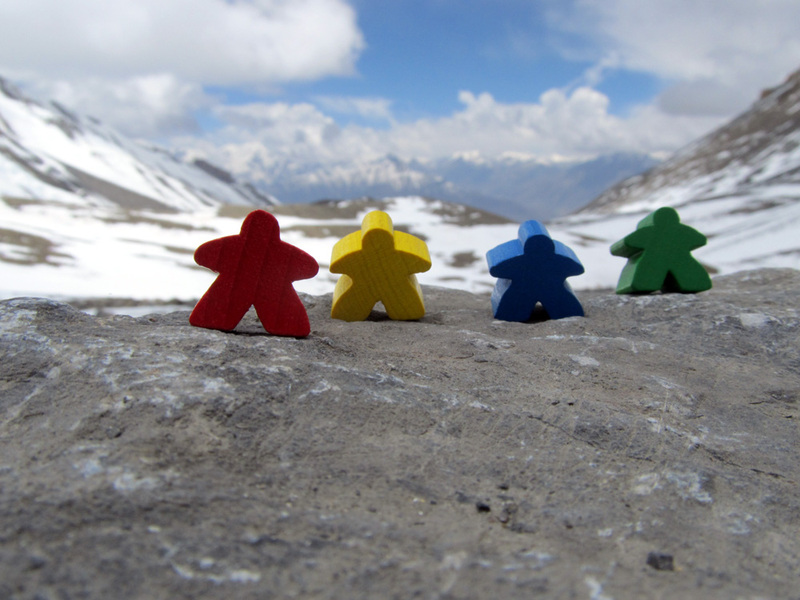 Next time, play K2 ( http://www.boardgamegeek.com/boardgame/73761/k2 ) ! Yeah, I did look into taking K2 with me but it was too big for my pack (plus I didn’t want to risk damaging someone else’s copy as I don’t own it).